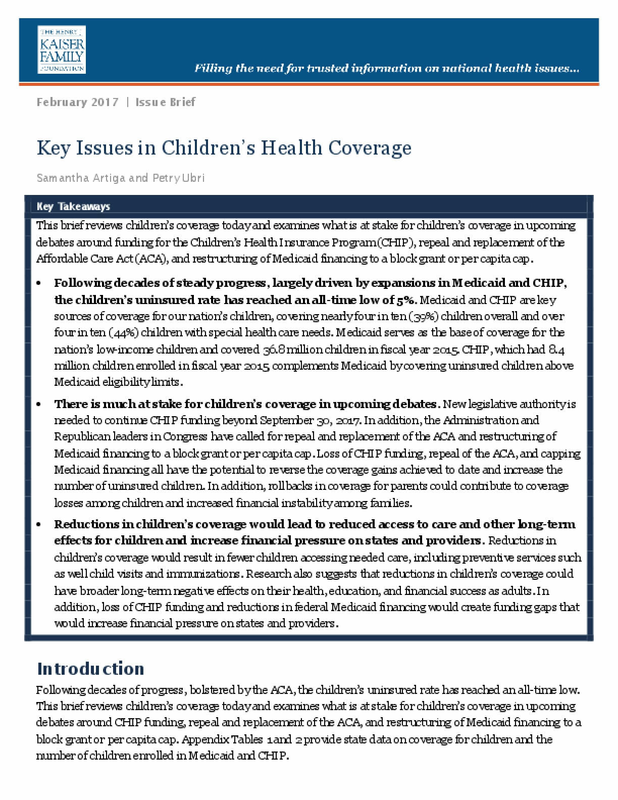 This brief reviews children's coverage today and examines what is at stake for children's coverage in upcoming debates around funding for the Children's Health Insurance Program (CHIP), repeal and replacement of the Affordable Care Act (ACA), and restructuring of Medicaid financing to a block grant or per capita cap. Following decades of steady progress, largely driven by expansions in Medicaid and CHIP, the children's uninsured rate has reached an all-time low of 5%. Medicaid and CHIP are key sources of coverage for our nation's children, covering nearly four in ten (39%) children overall and over four in ten (44%) children with special health care needs. Medicaid serves as the base of coverage for the nation's low-income children and covered 36.8 million children in fiscal year 2015. CHIP, which had 8.4 million children enrolled in fiscal year 2015, complements Medicaid by covering uninsured children above Medicaid eligibility limits. There is much at stake for children's coverage in upcoming debates. New legislative authority is needed to continue CHIP funding beyond September 30, 2017. In addition, the Administration and Republican leaders in Congress have called for repeal and replacement of the ACA and restructuring of Medicaid financing to a block grant or per capita cap. Loss of CHIP funding, repeal of the ACA, and capping Medicaid financing all have the potential to reverse the coverage gains achieved to date and increase the number of uninsured children. In addition, rollbacks in coverage for parents could contribute to coverage losses among children and increased financial instability among families. Reductions in children's coverage would lead to reduced access to care and other long-term effects for children and increase financial pressure on states and providers. Reductions in children's coverage would result in fewer children accessing neededcare, including preventive services such as well child visits and immunizations. Research also suggests that reductions in children's coverage could have broader long-term negative effects on their health, education, and financial success as adults. In addition, loss of CHIP funding and reductions in federal Medicaid financing would create funding gaps that would increase financial pressure on states and providers. Copyright 2017 by Henry J. Kaiser Family Foundation. All rights reserved.